It's time for a new challenge at Birthday Sundaes! This week we're challenging you to create a card incoporating NUMBERS! It can be a shaped card or you can use numbers as a background, etc. - the possibilities are endless! I really do hope you get a chance to play along with us this week. Our sponsor is our fabulous Kristie and she's offering up a very sweet prize: BIRTHDAY MAE FROM SOME ODD GIRL! This will also be our very last challenge for Birthday Sundaes for an indefinite amount of time. A special thank you to our wonderful sponsors, my fellow wonderful and absolutely wonderful design team members, and finally for Kristie, for taking a chance on a girl like me. This has been one of my very favorite DTs to be on and it's because of you, Amber, and everyone else. Thank you for everything! It's time for another Birthday Sundaes Challenge! 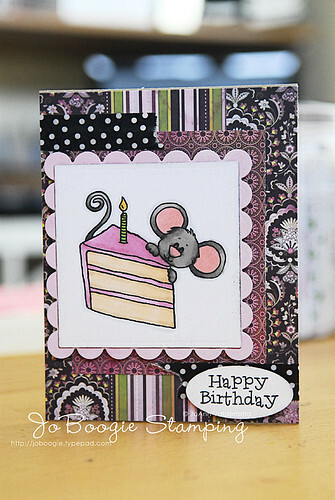 This week's challenge is to create a birthday card with a birthday sentiment that includes an animal! 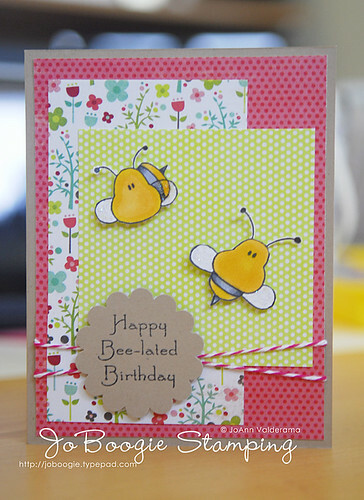 I've had these adorable little bee stamps for a while and can you believe I've never used them on a card? I found a sentiment stamp in my stash that I knew would be perfect. What do you think? I hope you get a chance to play along with us this week! We're being sponsored by Just Wordz and there's a prize to be won! Birthday Sundaes #47: use the color GREEN! I'm taking a wee bit of a break this week (it's been CRAZY here! ), but I wanted to make sure you play along with Birthday Sundaes! The challenge is to use the color GREEN on your birthday card! Check out the Birthday Sundaes blog for more info! Birthday Sundaes #46 Sponsored by Sweet 'N Sassy Stamps! It's another Sunday and it's time for another challenge at Birthday Sundaes! This week we're being sponsored by Sweet 'N Sassy Stamps so the DT has a lot of fun playing with their images to create a birthday card with a birthday sentiment this week! Love this little Cocoa! He's so stinking cute and a lot of fun to color! Hope you get a chance to play along with us this week at Birthday Sundaes! 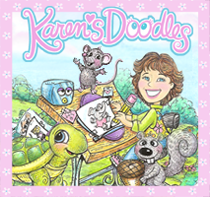 There are digi stamps to be WON! Birthday Sundaes #45: Get Messy! It's time for another challenge at Birthday Sundaes! This week we're challenging you to create a birthday card using paint, Glimmer Mist, inks, etc. - anything that will make you GET MESSY! But I really did have a great time with this challenge this week! Yay for challenges pushing our creative limits! Hope you get a chance to play along with us this week! This week's sponsor is Couture Stamping by Candice Fields, an independent CTMH consultant and a former Birthday Sundaes DT Member! Candice is giving away the CTMH Fashionista stamp set, shown below. Candice is also offering Birthday Sundaes fans a 10% discount during this challenge. You can find her store HERE and her blog HERE. To receive the discount, please email your order directly to Candice at stampinpearls at gmail . com (remove the spaces). Thanks so much for stopping by! I'll be back in a few with another Getting Cricky Simply Sunday Challenge! 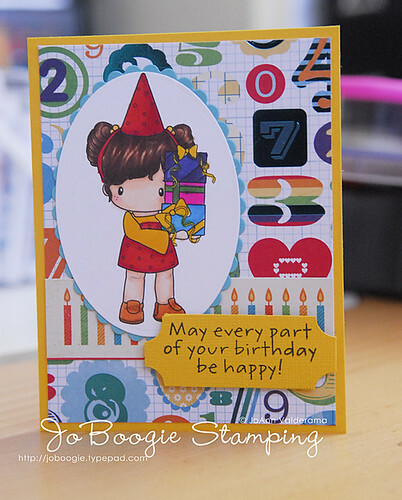 Birthday Sundaes Challenge #44: Create a STEP Birthday Card! Just in case you don't know how to create one, here are some links to a few tutorials! Pardon the extra stuff around my card - for some reason, my card kept slipping open! So frustrating! I hope you get a chance to play along with us at Birthday Sundaes! The prize this week is a $10 gift certificate to Stamp Fairy! Good luck and can't wait to see what you create! Birthday Sundaes #43: Inspiration Pic! 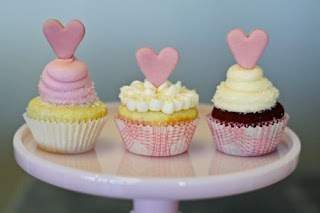 This week's challenge is not only based off the Inspiration Picture but you have to use a heart on your birthday card! Birthday Sundaes Challenge #42: Birthday Card with a Birthday Sentiment! Anyway, thanks for stopping by my blog today! It's time for a new Birthday Sundaes Challenge and it's everyone's favorite: Create a Birthday Card with a Birthday Sentiment! Birthday Sundaes #41 - Easel Birthday Card! It's time for another challenge at Birthday Sundaes! This week we're challenging you to create an EASEL Birthday Card! Would you believe me if I told you that this card was made with another image I had colored but never used on a card? Thankfully, I found it - it fits my card perfectly! Hope you enjoyed my card today. I hope you get a chance to play along with us this week at Birthday Sundaes! We can't wait to see what you do with the EASEL FOLD! Birthday Sundaes #40: Birthday Card w/ a Birthday Sentiment! It's time for another fabulous challenge from Birthday Sundaes! :) This week's challenge is to create a Birthday Card with a Birthday Sentiment and it's sponsored by the awesome MelJen's Designs! Hope you all get a chance to play with us this week at Birthday Sundaes! We can't wait to see what you come up with!